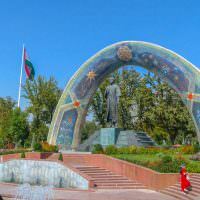 After a relaxing 11 days in the big city of Dushanbe, we hopped on a shared taxi and headed for Samarkand. The journey which is meant to take 7 and a half hours, actually took 11 because there were so many police check-stops along the way. 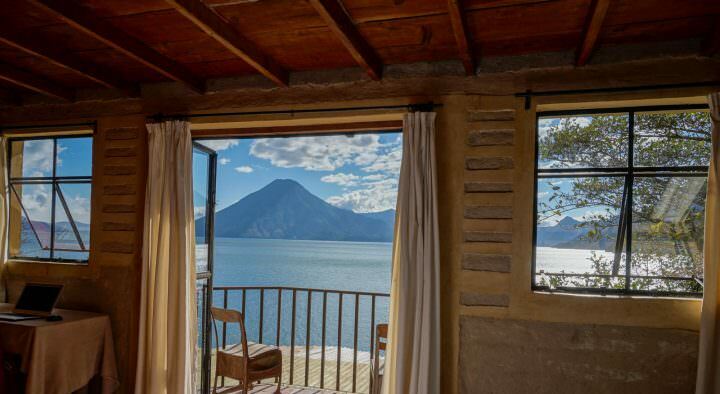 Finally, at around 6:00 pm, we arrived at our destination and checked into our guesthouse. Ever since we decided to come to this part of the world, visions of an ancient and opulent Samarkand have clouded our thoughts. 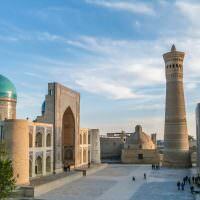 Along the Central Asian trail, other travellers spoke of the ancient city with awe and wonder. 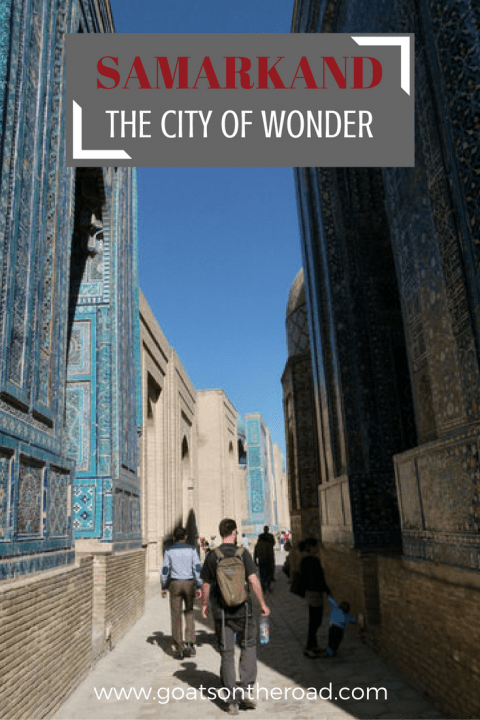 Perhaps one of the most architecturally blessed cities in the Islamic would, the city of wonder did not disappoint. In the 14th century, during the glory days of the silk road, there was a ferocious ruler who came into power in Uzbekistan. The tyrant’s name was Timur Tamerlane and he was as infamous as Genghis Khan for spreading bloodshed. Unlike his Mongolian counterpart, Timur didn’t bring reason and justice with his armies, only violence and carnage. He did, however, leave more than just a legacy of death and war, his legacy is Samarkand. Most of the wealth that “Timur The Lame” made from his ruthless plunders and robberies, he poured into his beloved capital of Samarkand. Today it stands as a testament to the prosperity of the times, and an ode to the incredible skill of the architects who helped build this magnificent city. We awoke the first day early and headed out on the ancient town. 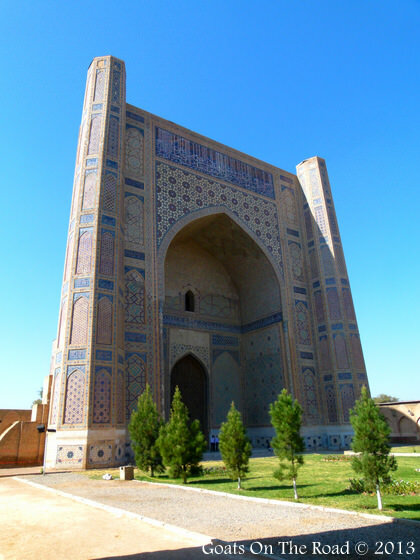 Samarkand is famous for many sites, but undoubtably it is most famous for its grandest site, the enormous Registan. This complex sits in the center of the old town and you can see it from miles away. Three massive mausoleums face each other, each with it’s own unique design and unimaginably intricate mosaic tile work. Thirty-three meter high minarets leaned topsy-tervy in the morning sky as we entered the major sites inside the Registan. After wandering around Samarkhand’s “best” site, we thought we had seen the best the city had to offer, but each attraction is so awe-inspiring that we would spend 4 days here without becoming tired of the brilliant architecture. We moved on to the tallest Mosque in the ancient city, Bibi-Khanym. We then crossed the street and visited the tombs of the same name. 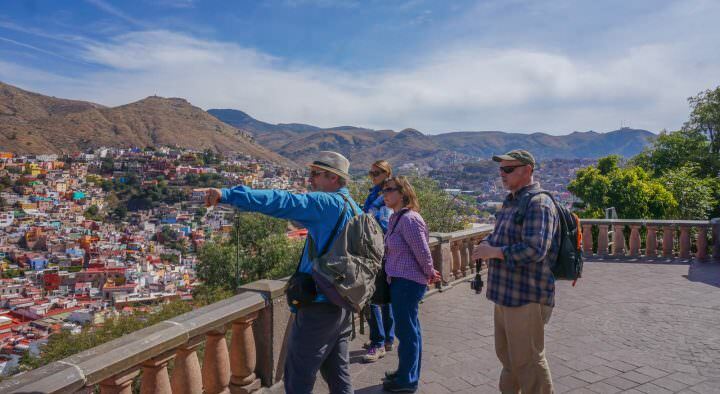 As we exited the tombs, we looked left and yet another stunning feat of engineering revealed itself, perched on a hill above a busy, modernized street corner. In Samarkand, you hardly need a map, because everywhere you look is something worthy of a city highlight. 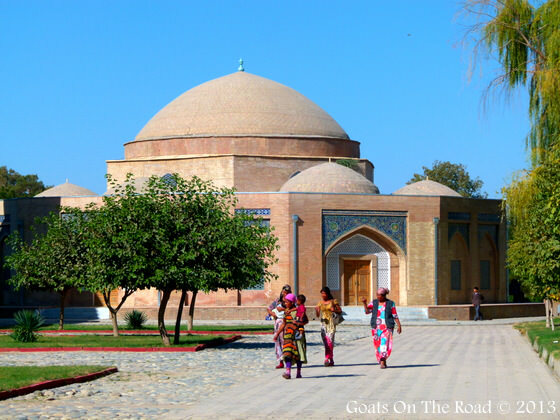 The structure on the hill was the Hazrat-Hizer Mosque and it is said to be the most beautiful in Uzbekistan. As with every mosque we glimpsed in the old town, the interior of Hazrat dazzled with impossibly fine paint brush strokes and immaculate patterns of tiny tile squares. The mosque itself was stunning, but the views from the outer courtyard were worth the trip alone. 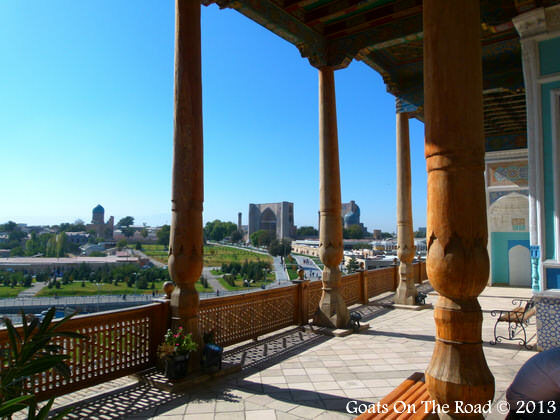 A perfect panorama view of Samarkand in all of her glory. Pristine and well-preserved buildings towered tall and proud on the horizon as they have for 1,000 years or more. Walking around the city for two days and taking in the wonder proved to be exhausting. We decided to spend an afternoon in a Hammam to relax and reflect on all we had seen so far. 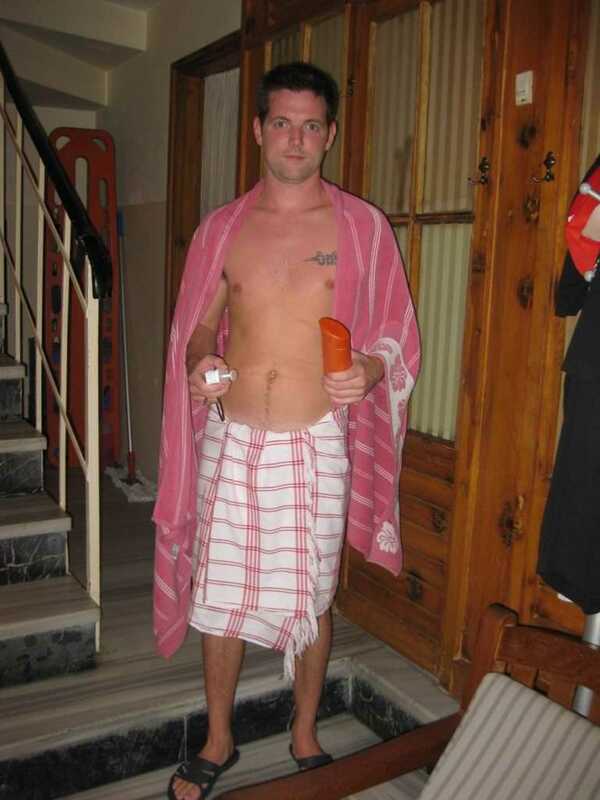 It turned out that our hammam experience wasn’t as relaxing and comfortable as we thought it would be! 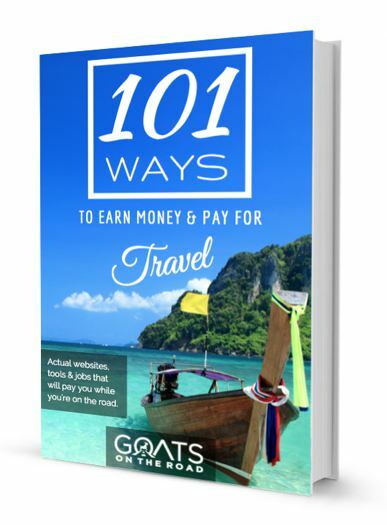 We thought it was going to be like the hammam in Turkey or the bath house in Kazakhstan. It turned out to be a place the locals who don’t have a shower in their house go bathe. As I entered the men’s bathing area (barefoot because we forgot our sandals), the first thing I saw was a group of men shaving their family tackle. The place was packed and the locals had found ways to scrub places I never thought I’d see scrubbed in public. Needless to say, we didn’t stay long. After the hammam, we wandered through an old cemetery and ended up in the Avenue Of Mausoleums, yet another site worthy of a flight to Central Asia. The avenue was actually made up of nearly 20 mausoleums all set in a row with a beautiful, cobblestoned walkway separating the structures. We quietly walked down the ancient alley and gazed up at the massive, ancient buildings above us. We couldn’t help but to wonder how they managed to build such colossal and opulent beauties with such basic and rudimentary technology. We spent a few hours at the Avenue. The sun began to dip low in the sky, bringing new life to the colours on the outer faces of each mausoleum. On the final night in Samarkand, after 4 amazing days in the city, there was just one last site to see, The Gur-E-Amir Mausoleum. 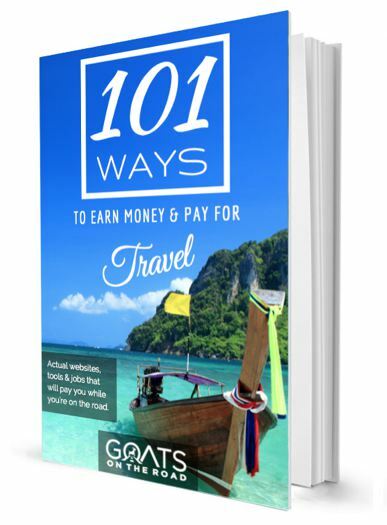 The Lonely Planet Guide Book recommends that visitors check this one out at night. As the sun set and the moon took its place in the night sky, a guard flipped a switch and turned on the evening floodlights. It was immediately obvious why the writers had recommended a nocturnal visit. The dome on the top of the mosque lit up and turned an emerald blue in the faintly lit night sky, while the blue, white and gold tiles on the outer walls, lit up like Christmas lights. The interior was equally impressive with golden Arabic letters gleaming in the artificial light. 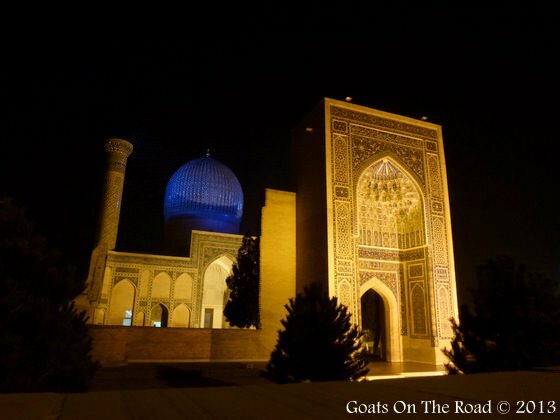 Gur-E-Amir is the only place in Samarkand that is lit like this by night, which is a shame because the architecture projects a completely different presence after sunset. 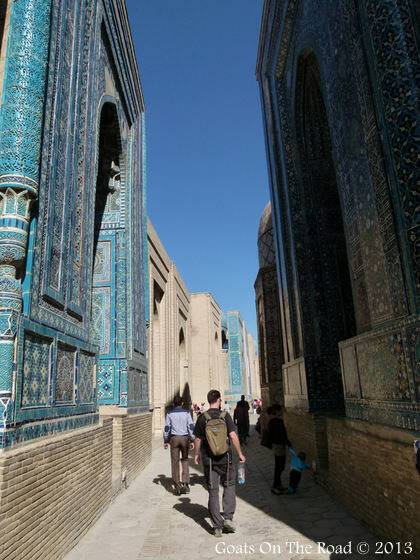 We spent 4 nights in Samarkand and we really wish we had spent more time. We visited mosques and mausoleums, hammams and tombs. Each one boasting it’s own special raison d’etre. The sites are so impressive that you really just have to sit on a bench and stare at them in awe. Only The Pyramids Of Giza could even hold a candle to the grandeur of the ancient architecture in Samarkand and much of Giza’s wonder is a result of its fame. 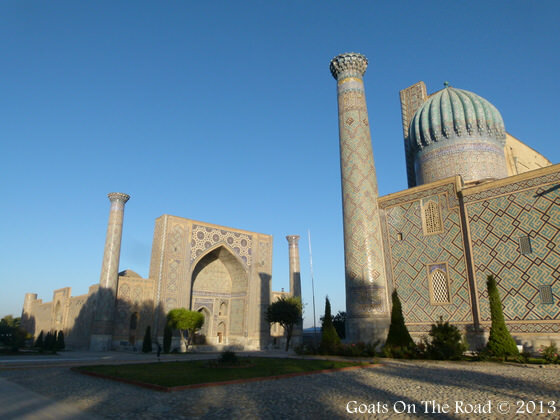 How Samarkand is not a Wonder Of The World is beyond me, but it’s one place that everyone should try to visit. It truly is the city of wonder. Wow! The architecture is so magnificent..